Chargrilled is a clothing company who make funny, retro and offensive clothing. They stock mens and womens clothing, they sell t-shirts, hoodies, jumpers and aprons with 1000’s of designs on. 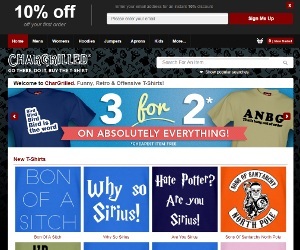 Looking for a funny, retro or offensive item of clothing then Chargrilled is for you. I guarantee there will be many designs that take your fancy, they are currently offering 3 for 2 on absolutely everything on their website, so instead of just getting 1 item why not buy 3.